Here you will find some guides that teach you how to use iWealth. Check back often for updated content! How does iWealth help you? Welcome to iWealth Tutorial Programme. 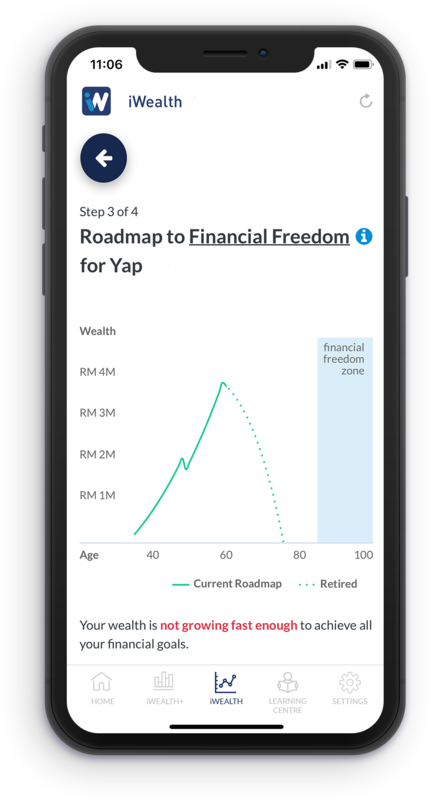 This programme is designed to help iWealth users to understand its various functions to fully optimise the usage of this important app. This Tutorial #1 explains how will iWealth benefit you. One of the main takeaways you will gain from iWealth is the knowledge of whether your wealth is growing fast enough to satisfy all the financial goals that you have set out to achieve in life, like buying a house, retiring earlier, ability to provide for your children’s tertiary education. To do that, a holistic wealth management approach is adopted to analyse your financial situation. This is not a simple retirement planning or education planning calculator. Many people make the mistake of putting too much focus and effort into investing to grow their money. However, if they could simply take the time or have the tools to help them figure out how much and how fast their wealth is growing, they may be able to save themselves a lot of trouble from under-investing or over-investing (taking too much risk). iWealth helps you to develop a list of personalised strategies to help you grow your wealth faster – it may include adjustments to your living expenses, ROI for your investments, and savings you would need to put aside. It is recommended that you log in and update your financial information on iWealth at least once a year since your financials and personal circumstances may change over time. By doing so, you can be assured that you can stay on the right track to achieving financial freedom.